You might wonder what vapor assisted sandblasting is, and the answer is straightforward. 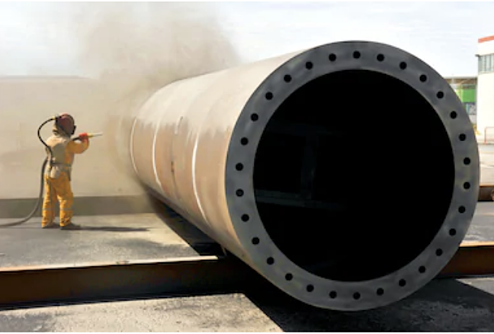 A vapor blasting system is made up of a machine that takes the water that is needed (a ninety percent ratio) and mixes it with a rate of ten percent fine sand media within a blasting vessel. After this ninety percent to ten percent mixture is complete, the machine then blasts the mix out utilizing the water and compressed air as it's source of pressure. The vapor assisted blast is sprayed out in a fine mist onto the substrate. So a vapor assisted sandblaster is composed of water, sand, and compressed air - controlled by a blaster nozzle, which is very easy to handle. Even though this kind of media blasting is simple, industrial painters know that care should still be taken when using it. 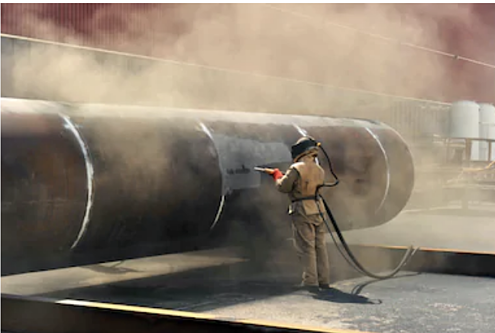 There are many benefits to vapor assisted sandblasting that industrial painters know can help in all kinds of places and situations. Location of Use – You do not need to worry about having to move any equipment to another location since the machines that are used are portable, which means it can be done at the work site. It does not matter if the substrate is in an area that is within a confined space since the health risks are very low, but if you want an easier time with cleaning up the contaminants, it is best to have the substrate in a covered area when possible. 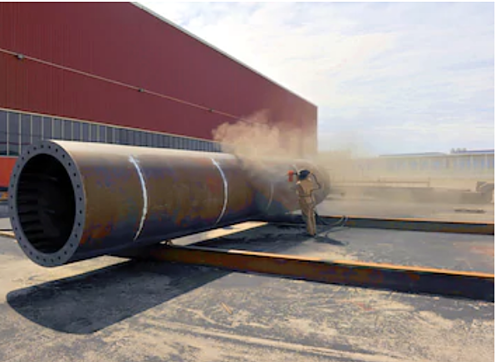 Contained Blasting Media – With the use of vapor assisted sandblasting you do not need to worry about containing the sand, as it is controlled within the water. This is a great benefit, with less cleanup time involved. Environmentally Friendly – The water combined with small amounts of fine sand is not harmful to the environment, which helps in sensitive areas that you might be working in or around. This also means that it is safe to use while other workers are near as long as standardized safety measures are followed, which can lessen the cost of down time. Fast Set Up – Since this equipment is portable, it is quick and easy to operate, which means less prep time. Prepares the Substrate Well – The vapor sandblasting gear creates such a fine grade mist on the surface, the coating(s) that must be applied afterward will be able to adhere completely. This gives the surface the best possibility of prolonged use. Not only does it make the surface scored for the next step, but it also cleans various build-up that is on the substrate. This includes such as soil, corrosion, oxidization, pollutants and previous coverings. Non-Permeating Media – You do not need to worry about vapor assisted sandblast hurting the substrate, as it is one of the mildest forms of media blasting. Lower Costing – Since most of the clean up involves gathering the removed surface of the substrate, the cost is kept to a minimum. When you are planning on doing any media blasting, it is always good to make sure that you have someone that knows what they are doing, so that your substrate has the best chance at being back on the job quickly and successfully. If you are not sure about doing the job yourself, then it is recommended that you contact a skilled industrial painter within your area that can do the work for you. They have the knowledge needed to tackle any job, as well as all of the equipment, which can save you from having to go out and either buying or renting this specialized machinery. Having a professional to handle such jobs can also save you and your business time and money, by being able to take the job when needed and within less amount of time. So why wait when you can get a free estimate and maybe your job can be completed before you had expected.